Later, West Virginia separated from Virginia and became part of the Union on June 20, 1863. 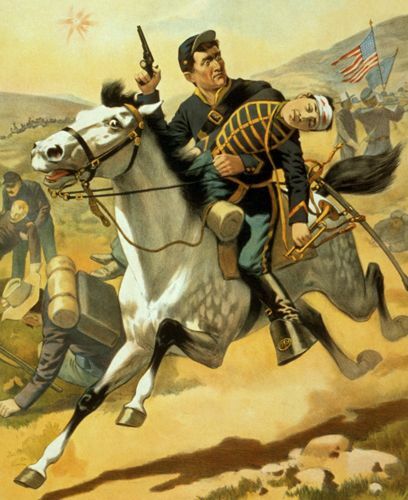 Nevada also joined the Union during the war, becoming a state on October 31, 1864. 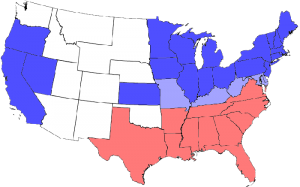 *In Kentucky and Missouri pro-secession factions declared for the South and those states were claimed by the Confederacy, but had both Union and Confederate state governments claiming power. The Union was opposed by 11 Southern slave states that had declared a secession to join together to form the Confederate States of America. When the Civil War began in April 1861, there were only 16,000 men in the U.S. Army, and many of these were Southern officers who resigned to join the Confederate States Army. With a drastic shortage of men, President Abraham Lincoln called on the states to raise a force of 75,000 men for three months to put down the “insurrection.” Though Lincoln thought the war would be brief, he was wrong, and on July 22, 1861, Congress authorized a volunteer army of 500,000 men. Initially, the call for volunteers was easily met by abolitionists, patriotic Northerners and many immigrants, enlisting for a steady income. However, when it was apparent that it would take more than 90 days to put down the insurrectionists, the Federal Government began to offer bounties to volunteers and instituted a draft. There were many people living in the Border States who opposed secession and supported the Union. These men were called “Unionists,” though they were often referred to by Southerners as “Homemade Yankees.” Nearly 120,000 “Unionists served in the Union Army during the Civil War, and every Southern state raised Unionist regiments. During the war, the Lincoln administration wrestled with the idea of authorizing the recruitment of black troops. 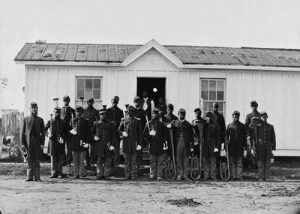 However, by mid-1862, with the declining number of volunteers and the need for more troops, the Union Army pushed the Government into allowing African-Americans to serve. 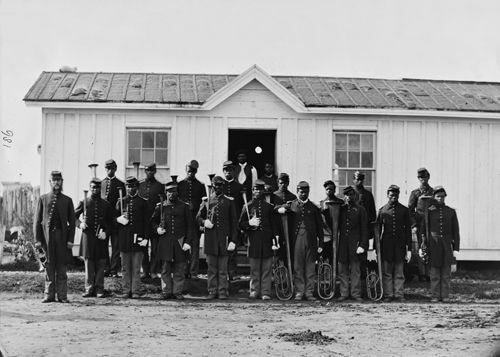 By the end of the war, about 179,000 black men served as soldiers in the By the end of the Civil War, almost 200,000 black men served as soldiers in the U.S. Military. Another type of soldier also served the Union — somewhat unusual, these troops were Confederate soldiers called Galvanized Yankees. In the midst of the Civil War, the United States was also dealing with another issue — that of the many emigrants heading westward. With their troops in the last stages of fighting the conflict with the South, it was a difficult task to protect the many pioneers on the trails and combat Indian uprisings. As early as 1862, Colonel James Mulligan discovered that many Confederate prisoners did not wish to be exchanged, were willing to join the Union army, an he illegally enlisted former Confederates to be used on the front lines. 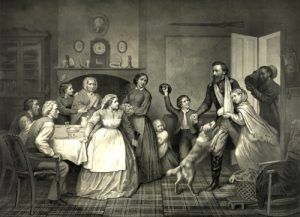 This became even more apparent in 1863, when the prisoner exchange system broke down and the imprisoned men had no hope of release until the end of the war. As the need for troops in the American West became more critical, the experiment of enlisting Confederate prisoners became a topic of discussion in the U.S. War Department. In 1864, President Lincoln endorsed the enlisting of ex-Confederates, who could win their freedom by swearing their allegiance to the Union and enlisting in the Union Army. However, due to doubts of their ultimate loyalty, they were almost always assigned to posts far from the Civil War battlefields, in posts in the American West. Numbering about 6,000 men, there were six regiments of U.S. volunteers during 1864 and 1865. Despite the varied origins of these thousands of men who were “Galvanized” during the war, each had the chance to prove his loyalty to the United States and were a valuable presence at a time and place in which they were needed. Union Generals Winfield Scott, George McClellan, Nathaniel Banks, and John Wool, by B.B. Russell, 1861. In total, at least two and a half million men served the Union Army, most of which were volunteers. The Union Army was composed of numerous organizations, which were generally organized geographically. The soldiers themselves were Soldiers were organized by military specialty, such as infantry, cavalry, and artillery. The operations of the Union were divided into five geographic regions known as theaters, including the Eastern Theater,Lower Seaboard Theater and Gulf Approach, Pacific Coast Theater, Trans-Mississippi Theater, and the Western Theater. 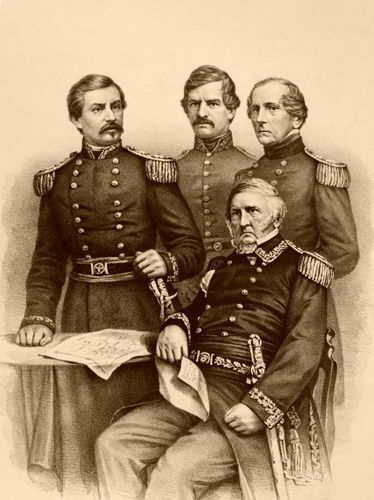 Several noted men served in as Generals-in-Chief of the Union Army during the Civil War including Winfield Scott,George B. McClellan, Henry W. Halleck, and Ulysses S. Grant. Notable field commanders were William Rosecrans, George Henry Thomas and William Tecumseh Sherman. The Union had several advantages from the start, including three-fourths of the nation’s wealth, heavy industrialization which provided weapons and supplies, and nearly five times the white population of the Confederate states. 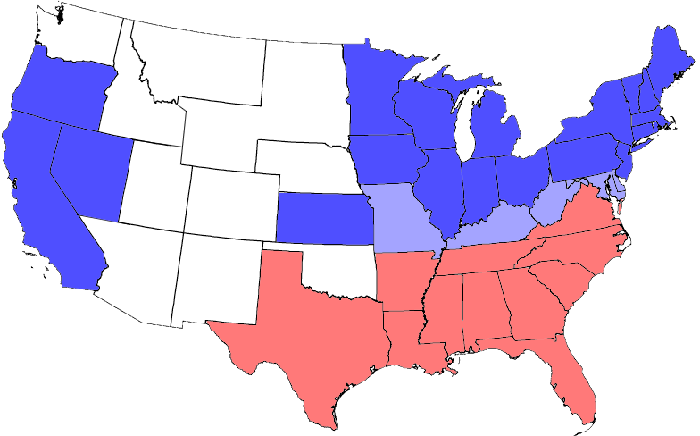 The Civil War had less devastating effects on the North than the South, as most of the battles occurred on Southern soil. However, there were conflicts in the North as Confederates raided northern states in hopes of deteriorating the Northern morale. The Union Army fought and eventually defeated the smaller Confederate States Army during the war which lasted from 1861 to 1865. Of the 2,213,363 men who served in the Union Army during the war, 364,511 died in combat, or from injuries sustained in combat, disease, or other causes, and 281,881 were wounded. This was more than one out of every four Union soldiers killed or wounded. For the South; however, it was even worse with one in three Southern soldiers were killed or wounded. In total, 620,000 soldiers died during the Civil War, or about two percent of American population. Home again, Trevor McClurg, 1866. Click for prints, downloads and products. © Kathy Weiser/Legends of America, last updated August, 2017.